Heat waffle maker according to manufacturer’s directions. Place frozen biscuits on microwavable plate. Microwave uncovered on High 20 seconds; turn over, and microwave 15 to 20 seconds longer or until biscuits are softened. Spray work surface lightly with cooking spray; press each biscuit on surface into 4-inch round. Sprinkle one side of each biscuit with 1 teaspoon pecans, pressing slightly into dough. Place 1 biscuit at a time on waffle maker. Close lid of waffle maker; cook about 2 minutes or until golden brown. Top each with banana slices, blueberries, syrup and remaining pecans; serve immediately. 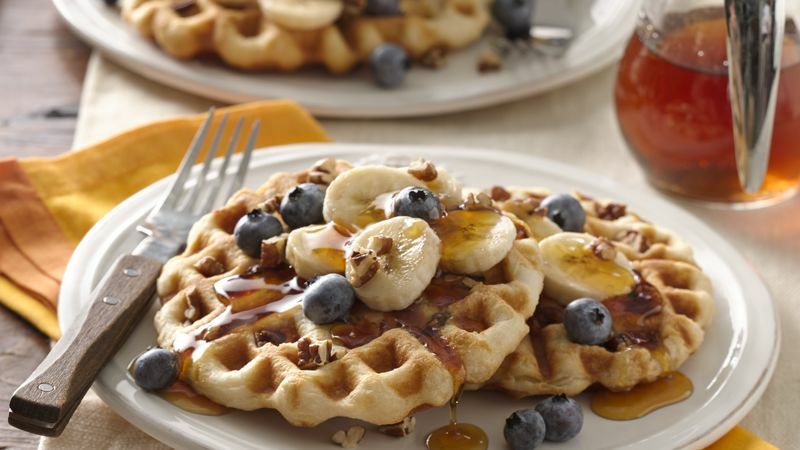 Yogurt and fresh fruit also make great toppings for these waffles. This recipe can easily be doubled to make 4 servings!